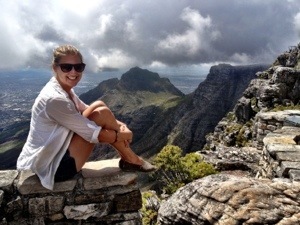 We had a tight schedule when it came to exploring Cape Town. 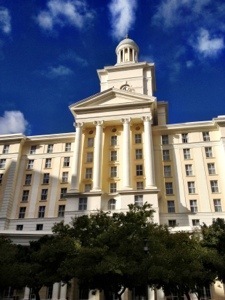 We had two less days in South Africa than we had originally thought. Two blondes trying to count the number of days in February is a disaster. What happened to the 29th and 30th of the month?! Oh that’s right, they don’t exist. And just like that we were two days short. Fantastic! 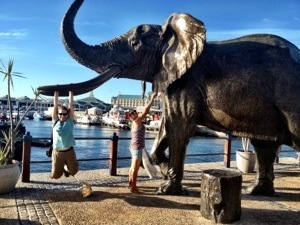 We cut one day off our road trip and one day off Cape Town. Then we filled our days with as much as we could. We arrived on Friday pretty early. This was perfect because it was a day in the city we hadn’t counted on. We hit the markets, got accustomed to the city center, checked out the waterfront and went for an incredible Italian meal in the evening. 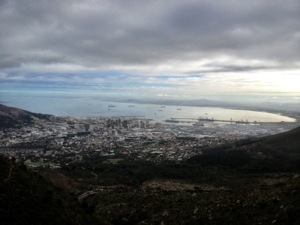 Cape Town is amazing! The city has such a great laid back vibe and the people are so helpful. Long street offers everything a young backpacker could want: clothing stores, markets, great restaurants and a fabulous nightlife. 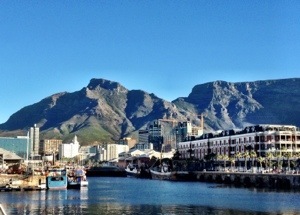 The waterfront is simply stunning. Fancy restaurants, out of this world seafood, sunset cruises, and quaint shop fronts; the waterfront is the hub of life, and was packed full of people throughout the day and evening. 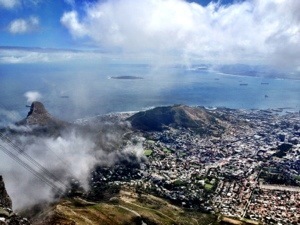 On top of all that, Table Mountain can be seen from almost every part of the city. It stands on a hill behind the hubbub of urban life and looms down over the city. It is stunning. 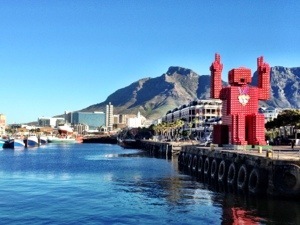 Table Mountain combined with the unusual looking Lions Head makes for a gorgeous backdrop to an already wonderful place to live. Saturday morning we got up early so we could hike the mountain ourselves. No one was really sure what to expect. We’d heard it wasn’t so bad from one person, then we heard it was the most exhausting thing ever and we wouldn’t be able to walk for days after hiking it. Oh well, we were doing it anyways. 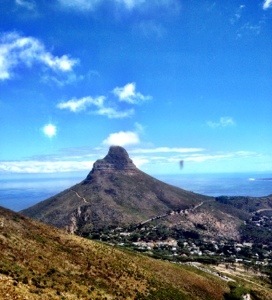 So Kelsi, Gina, Anisha and I caught a cab to the base and began our slow ascent. It was steep, and far, I’m not going to lie. The sign at the bottom estimated a 2 and a half hour climb time… But we were mentally prepared. “I’m going to go ahead and assume it will take me three hours” I said, “that way I won’t be disappointed when I don’t reach the top right away.” And so we climbed. And we climbed, and ten minutes into the journey I couldn’t believe that we hadn’t already been hiking for 45 minutes. 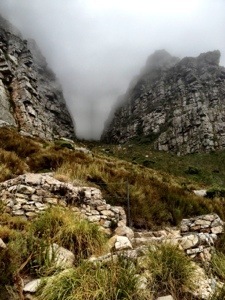 But the morning was cool and the hike wasn’t as bad as I had expected. Actually, it was really fun! We passed a whole lot of people stopping to catch their breath on the way up, but trekked on at a steady pace. At one point Anisha had a flip flop blowout and had to start walking barefoot. Kelsi and I trekked forward while the two of them made their way up more carefully, step by step. I couldn’t believe it, but 1 hour 27minutes later we reached the top. “We made it!! !” Kelsi exclaimed. It didn’t seem possible, but we had hiked to the top and I didn’t feel like I was near death either! What a bonus. Unfortunately, during our hour and a half climb, our beautifully clear morning had disappeared and fog surrounded the top of the mountain. We hike ALL that way to come into a cloud of white. Fabulous. Either way we were stoked we had climbed it. We ran this way and that once we got to the top, trying our best to catch a view. 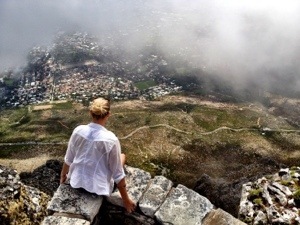 We sat on some rocks just as the view cleared up enough to see Robben island, then in a matter of seconds it was back to white. So we passed the time waiting for Gina and Anisha by having breakfast in the cafe, climbing around on every cliff face we could find, and creeping in on a wedding that was going on. After two hours, we were wondering where they had gone. We were so obsessed with catching even the most minute view, that we hadn’t realized how much time had passed. “Maybe they went down the mountain without us” we thought. So we bought a tram ticket down and hoped for the best. 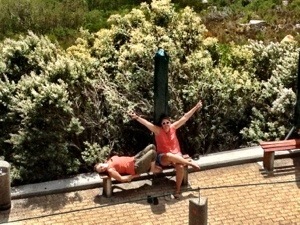 Sure enough, the two of them were crashed out on a park bench waiting for us! They had made it up only ten minutes after us, but couldn’t follow our sporadic pattern at the top and missed us. Oh well. The rest of the day was filled with dress shopping and bevvies around town. Finally a city with nightlife! When our dress shopping afternoon was over, we met up with Falafel for a Mexican dinner on Long street. We ordered nachos and enchiladas and beers and a litre of margaritas. Well… Kelsi ordered a litre of margarita. When dinner was finished all of us were a couple beers deep, and Kels was a litre in. It was hilarious. 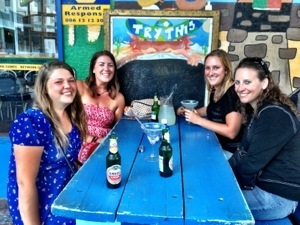 We trekked back to our hostel and started back up at the rooftop bar. Kelsi went around introducing herself to every person on the roof, while we all switched to vodka to try to keep up. All of a sudden Kelsi was missing and Anisha said she had “taken a quick nap” and we were supposed to grab her when we headed out to the clubs. Oh no. An hour later we were all caught up and we rushed to grab Kelsi on the way out. “We’re going to the club baby!! !” I shook her. No response. She was curled up and dead to the world. “Kelsiiiii, wake up! !” Nope. Nothing. 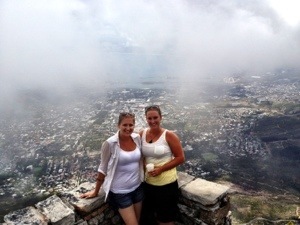 So off we went, out to explore the nightlife of Cape Town with our new found friends… Until the sun rose. I refused to believe it was 6am until I turned and saw the glow of morning light coming over the hill. Okay… Time to go to bed. It was probably a good thing there wasn’t anything else open, because Gina, Anisha and I would have been there. Instead we called it a morning and crashed in bed. So Gina and I rolled out if bed and we jumped in a cab to the waterfront where we had eggs benny at a cute little cafe by the ocean. Afterwards we tried to complete the days activities. By a CD, get some new flip flops, book our car rental. It was overwhelming, I couldn’t do it: I got cranky. “I’m going for a nap” I announced, then took off towards a cab. An hour nap was all we needed to survive the rest of the afternoon. Then we were up and exploring the food markets back at the waterfront. We had some savory soups, fresh baked sourdough bread, the most incredible halloumi samosas I’ve ever tasted, and then taste tested a plethora of cheeses and olive oils and meats from various food stands. Everything was incredible. And from that point forward… We were on our own! 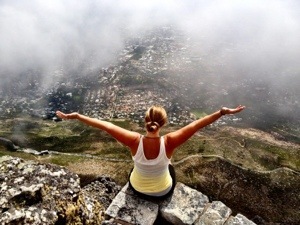 This entry was posted in Africa, South Africa and tagged Cape Town, South Africa, Travel by hilarylust. Bookmark the permalink. Your city is incredible! It’s one of the few places I’ve visited that I can picture myself living in. 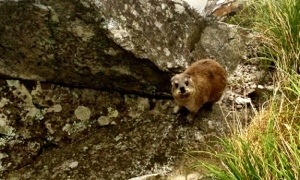 Yes, the dassie was quite a shock. We’d never seen one before and had to ask the lady at the gift shop at the top what it was! I’m looking forward to checking out your blog!